Cherie Watters, President of our Dealer Division wants to Talk Consulting with you! Our new dealership consulting services are designed specifically to help you improve results with women. Cherie is a big believer in honesty and integrity and I share those same values with my staff and business contacts and colleagues, as well as anyone that I encounter personally. Her philosophy is: If you make people happy, take care of their needs and listen to them, you have made a customer and friend for the long term and they will keep coming back. 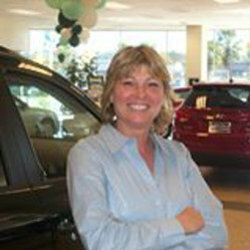 Cherie has served in many leadership roles outside of the dealership including President of the Advertising Association with Hyundai Motor America and co-founder of the Women’s Business Association in the San Gabriel Regional Chamber of Commerce. She was honored to be awarded with the 2012 Spirit of Leadership award from the Women’s Automotive Association International. Cherie is a graduate of Nova Southeastern University Wayne Huizenga School of Business with a degree in Banking and Finance. Implement or improve your existing Business Development Center & Improve your dealership’s utilization of the current CRM solution. Improve utilization of CRM Increase the appointment show rates for sales and service. Reduce advertising cost , Increase in customer satisfaction scores, grow your customer data base, increase customer loyalty and improve marketing efforts across all metrics. Improve your dealership’s online presence with best practices and learn ways to maintain the best possible positive image for our clients. We will analyze where and how your money is being spent to make sure you are getting the full advantage of your advertising dollars. Our dealership consultants review operations to assist our dealers in improved performance and enhanced productivity to maximize profits. In addition to on site consulting services, we offer best practice workshops and best practice matrix meetings to share our knowledge and experience with our partners. Our new dealership consulting services are designed specifically to help you improve results with women. Contact Cherie Watters today for more information to learn more about how women drive revenue in your dealership. Please add kaeli@askpatty.com to your address book or safe sender list so our emails get to your inbox. AskPatty.com, Inc 38180 Del Webb Blvd PMB 157, Palm Desert CA 92211-1256 United States.